In the brilliant (alas, cancelled) Forever series, Episode 17: Social Engineering, Detective Jo Martinez, and her ME Dr Henry Morgan are called to the apartment of a young murder victim whose flat switches itself on whilst they are there. The morning radio comes on, the coffee maker starts to percolate, the heating switches on, and the blinds open, all controlled by an alarm on the victim’s phone. The victim turns out to be a Faceless hactivist who hacks into Times Square’s billboards to play footage of politicians behaving badly, and into New York City’s municipal systems to alter everything from traffic lights to residents database information. So, it makes sense he would wire up his creature comforts to make his flat more ambient. The only downside, according to the NYPD cybercrime unit, is that his network was hacked. Someone logged in to turn on his boiler and cut the pilot light, which resulted in his being gassed. Murder by remote control. The story might be fiction, but in reality, having a wired flat is very much a reality. According to the US Federal Trade Commission there are around 25 billion devices connected to the Internet which will double by 2050. These devices are available in every context from heart monitoring implants to field fire-fighting search and rescue operations. Each device collects data and then autonomously flows the data between other devices using APIs, data formats and network protocol stacks in order to improve overall performance. It sounds complex, but when coupled with a familiar device like a coffee machine and resulting nice ambiance, Mmm smell the coffee, the result is one of simplexity – an emerging theory which balances the need for simplicity and complexity, and the design focus for the future of the Internet of Things (IoT). The Triby Fridge Memo, an e-ink display you put on the fridge and when you write on it, it sends messages to the rest of the family. The smarter am app which will customise your coffee, so if your fitness tracker says you slept badly, it will make you a double espresso to get you up and at ’em. Gimmicks aside (cocktail mixer and fizzy water dispenser, yes please), a really useful one is the CO2 detector which in the event of an emergency would talk to you, your thermostat, and turn off your boiler. The biggest problem us consumers have is deciding who will look after our smart homes. Is it Google with Nest? Or Apple and its golden handcuffs of proprietory software? Shame really, as these simplex gadgets have been around for many years just waiting on an industry standard to allow them to talk to each other. But, it is not just the devices in this ambient intelligence interestingly enough which need monitoring, it is us humans. HCI designers have been saying for years the human is a factor in the design. With IoT, this is truer than ever before. Humans become devices to be monitored. One way is with physiological computing. The physiology of a human is monitored and used as input to a system. So, if you arrive home and are a bit hot, your home might turn the heating down. Or, a computer game could modify its level of difficulty according to the amount of times you shake the controller in frustration. Recently, Douglas Coupland asked in the FT: How much data am I generating? Involuntarily and otherwise. Everywhere we go, we generate data with Oyster cards and shopping bills at Tesco. Coupland wonders which algorithm is at work mining away in some big data pool in order to learn everything about us. His main fear is that it will all be monetised and we will end up being part of some sort of pay-per-click click junkies. Ironically when I reread Coupland’s article online, it kept asking me if I wanted to tweet a quote. And, often when signing up for something online, I am asked to share this with friends on Facebook. Just imagine a wired house of consumer products: You’ve just left a note on the Triby Fridge Memo, share this with your friends. Your coffee is a double espresso today, tweet this to your boss. Gah! But, it is not just posting online which causes oversharing and potential security risks. Many people don’t change the settings on their new devices when they bring them home. So, devices are left to broadcast openly across the Internet which allows a would be burglar to scan local IP space and then gain access to footage of people at home, build up a pattern of behaviour and then break in, when everyone is out. To say nothing of the virtual visitors who tiptoe around and tamper with your systems when you are at home. But even those humans who change the passwords on their devices, might still write their passwords on post-it notes and stick them somewhere everyone can see them, or worse still, use the same password everywhere. Designers know that humans are the weakest link in any system, which is why biometrics are being proposed as the way forward. If we use what humans have already it will be less painful than implanting chips under our skin or needing to remember our wearables. We are all unique, well, not really, our fingerprints, contrary to popular belief, are not unique identifiers, but the retinal scan has an error rate of 1 in 10 million – not bad! Even so, if someone wants to access your system they will. Using brute force attacks as a starting point, it is easy to imagine someone compiling a database of fingerprints or even retinal scans to virtually or physically enter your home. To counter this, unique biometric identifiers are being explored such as gait analysis and Nymi’s heartbeat recognition. Say the intruders have got in and left with your best kit, everything is not lost, the broadening application of block chain authenticity could help you retrieve them. It is possible to stamp your devices, rather like your bicycle. Up until now Bitcoin has been used as cryptocurrency a form of money that can be transferred securely and anonymously across a widely distributed peer-to-peer network. The Bitcoin blockchain is an auditable ledger of all the transactions that have occurred on the network so far. It is a trustless system because the Bitcoin network itself is guaranteed to keep a fair and accurate record of which bitcoins belong to whom. Removing the emphasis on currency and keeping the blockchain technology, it is possible to track the history of individual devices and keep a ledger of data exchanges between it and other devices, web services, and human users. The only downside is creating massive data trails, but when you have lots of devices in your home, your office, and in cities talking to each other, to humans, to the Internet, well we are talking a lot of data anyway. Plus more machines needed to process it into something meaningful. How much energy will the IoT need? Currently, 25% of UK energy is consumed in the home and this will only increase. Panasonic in Japan has created the first sustainable smart town called Fujisawa. It is built on the site of an old Panasonic factory and is designed for a population of 3,000 people. The town has a smart grid with everything connected to it. Each house and apartment block has solar panels, and fuel-cell generators which generate and redistribute energy around the house, and then the town grid juggles all these variables of renewable technology and town demands. Engineers anticipate a 70% drop in each house’s carbon footprint, and have anticipated earthquakes too. Enough power can be stored for three days of off-grid operations. And, this is where the IoT gets a whole lot more interesting. If we can use technology to generate energy and redistribute the resources that we have across towns and eventually countries, then there is the hope, that one day everyone the world over will be able to wake up in a secure home to listen to the sounds of their creature comforts making their home an ambient one. The IoT has the potential to redistribute the future more evenly. Simplexity at its best. I was glued to the telly during the Channel 4 series Humans which is set in our present day but with a fictional history of robotics. In this alternate present, robots, who are known commonly as synths, have advanced to the point that they look, walk and talk like humans. However, they have replaced many humans in the workforce causing high unemployment, protests, and rioting. (They have their own twitter hashtag #WAP – We are people). Smart and computer-savvy teenager Matilda rebels at school because if the synths do all the jobs what is the point of her working hard to try and get one? But, it is not all bad, synths do all the chores around the house. How fabulous is that? Looking on the tie-in Persona Synthetics website, I could get Sally the synth to do childcare, cooking, and personal training. What a shame household-synths are just fiction, even hoovering robots, which do exist and look very cool, wouldn’t do much to alleviate the repetitive household tasks of cooking and cleaning. Alas, I just don’t see a robot coming onto the marketplace anytime soon to keep my home running efficiently. Nor, do I see them taking over the world and turning me into a battery. Derek Thompson in Atlantic magazine is not so sure. He thinks it won’t be long before technological advances have made such an impact on our society that there are no jobs for people. In his article A world without work, he says that robots are everywhere: Operating theatres, fast-food counters, checkout screens, and in the sky flying as drones. Currently in the US, manufacturing is on a cyclical upturn so we can’t really see where else robots may be stealing jobs until recession hits, which is when employers turn to technology to cut costs. The effects of replacing humans may not be seen until the next recession, or the recession after that. But in the meantime Thompson says Airbnb has cut hotel jobs and Google’s self drive car threatens the most common American job of all – driving. As humans, we adapt very quickly. Ask yourself: Would I trust a car without a driver? I trust the DLR and that doesn’t have one. What about black cabs? Would I miss the friendly banter of a London cabbie? I think I’d manage. And, research has shown that even areas in which we imagine robots wouldn’t be as useful, such as in the field of psychology, people are very happy. This is because they believe that robots don’t judge them like humans naturally do. The elderly person confiding in an electronic emo-seal is no different from a person praying to a god, who may or may not be there, or talking to a pet that definitely doesn’t have a grasp of life or death, but can give comfort by its presence. And that is the point of inventing anything: to give comfort and to make life more comfortable for humans. The first arrow: This mammoth runs too fast, chuck this instead. Brunel’s Underground: Gah the traffic, let’s build a train underground. Bazelgette’s sewers: I am so sick of having poo land on my head. These solutions probably created lots of new jobs such as butchers, engineers, drivers, night soil collectors, jobs which still exist today. Ghanaian night soil collectors I am sure would welcome robots and technology to help solve their sanitation crisis and worry less about being replaced or robots taking over. Joel Lee is worried too and has written a blog post to reassure himself that humans will always be needed in the creative arts, professional sports, healthcare and medicine, education, quality assurance, politics and law. Poor Joel! The comments below his blog say that computers can do these things already. I haven’t checked all the links but they sound reasonable enough: Computers create art. An IBM mainframe is working with doctors to diagnose cancer, betters than doctors do. And neural networks are reasoning up a storm in many areas. As for sports, I remember when Chris Coleman was manager at Fulham FC and was asked why his team had no one English in it one Saturday. He answered by saying that he would put out a team of aliens if it allowed him to win a game. So, I am sure he would definitely been open to a team of robots. Technology may take away jobs but there are new jobs which could not be done without a computer: biomedical scientists, quantitative analysts, anyone working with big data: big data engineers are in fields from manufacturing right through to food production and hospitality along with big data architects who structure the big data, to name but a few. However, these are highly skilled jobs in which you have to be skilled at the domain and skilled in computing. So, for example in hematology in biomedical engineering you have to know everything about blood and a lot about computing. But, never fear there are loads more jobs with varying skill sets which didn’t exist before computers such as: twitter feed manager, video game designer, website manager, usability consultant. I guess if machines got clever enough they could do these too. A quick google round the Internet shows me that a lot of people are upset about the idea that computers may one day do away with all jobs. But really, if we are so advanced why do so many boring jobs still exist today? And why are new boring jobs springing up all the time? In one of writer Elizabeth Gilbert’s podcasts, Elizabeth talks to Missy, a Florida call centre worker, who has to follow a script when talking to people who phone up to sort out their insurance. Missy is not allowed to deviate from the script or engage with the human on the end of the line in any empathetic way otherwise she is reprimanded. Consequently, Missy describes her job as the most boring job in the world. Surely this is a perfect job for automation – it doesn’t seem to have been designed with humans in mind inside or outside of the call centre. Sadly though, Missy is not alone. Investors In People published a survey at the beginning of this year which said that 60% of UK workers are unhappy in their jobs, citing lack of job satisfaction. The majority of people who work are doing for the money to pay for the things we need: food, shelter, etc., the things at the bottom of the pyramid of Maslow’s hierarchy of needs. Two years ago the Swiss voted no to universal wages which is a scheme which would ensure that everyone, who was legally entitled to work in Switzerland, whether working or not would be paid a basic income. Key supporter Enno Schmidt’s argument was that a society in which people work only because they have to have money is: no better than slavery. Instead, a universal income would allow people more freedom to decide what they really want to do. The Guardian ran an article about writers on the dole saying that unemployment benefits have given many writers the freedom to learn their craft without starving. Imagine, if everyone got paid something without the need to explain themselves at the job centre. Oooh – no more jobs for the job centre workers. Interesting. It wouldn’t be enough though would it? Because we define ourselves using a premise which is false: The more we do, the more we are worth. And so those people who used their universal wage to lie on the sofa and watch telly – very happily indeed,thank you very much – rather than tackle the upper levels of Maslow’s hierarchy of needs such as status, reputation and self-actualisation, sadly, would be judged lacking. We judge everybody including ourselves. And, this is perhaps where robots and computers can teach us something new and liberating, like the robot psychologists who don’t pass judgment. If we could all just be more flexible with our interpretation of worthiness and our expectations of how things like call centres should work (especially those ones in which humans are forced to behave like robots), then perhaps we could learn to love the machine and not rage against it. During a bout of channel hopping, my daughters and I started to watch James Bond Die Another Day. NSA agent Jinx (Halle Berry) shot a baddie in a gene therapy clinic and then chased and shot at another one who escaped in a helicopter. She then dived off a cliff into the sea below and swam to her waiting speedboat. The next scene switched to Bond, but my girls weren’t interested, they wanted me to rewind live TV so that we could just watch Jinx. It is the same when they play Lego Lord of the Rings and Lego Star Wars on our PS3. They always choose open world mode so that they can make up their own stories and play with just the female characters. I was desperate to see women taking centre stage when I was a girl too. I just didn’t have the technology to do anything about it. Everything seemed to be all about men and this is because many stories were and still are based on the hero’s quest or monomyth identified by Joseph Campbell who said that women’s stories are to be found in fairytales. Fairytales are more women-centred, but they are not the female equivalent of the hero’s quest. They are a historical reflection of women in society. For a long time, women didn’t have rights, possessions, or power. They needed to marry and have children in order to survive in the world of men. So far, my girls know fairytales because of Disney, which are jollier than the Brothers Grimm. Tangled‘s Rapunzel going off to see the floating lanterns is much nicer than the Rapunzel who gets swapped for a lettuce. Even so both stories are about the girl in a tower who gets rescued and married. My girls play at getting married a lot and I wonder if their exposure to fairytales will limit their expectations and aspirations when it comes to their own lives as stories have power. So, I was satisfied when my eldest said she was playing at the Princess getting her PhD and then getting married – even if she did wink when she said it. We tell ourselves stories all the time and shape our lives that way. So, when my girls are playing video games I like to think they are moving women centre stage. Over on fangirl blog there is a blog series about rewriting the monomyth and what a feminine parallel to the hero’s quest would look like. Campbell looked backwards for his model. So looking forwards would be a way to create a strong female stories which reflect feminine concerns and ambitions. Historical novelist, Philippa Gregory has found a way of looking backwards to find strong female stories as she shifts women into the centre of the history we already know. She describes her approach in the back of Lady of the Rivers, part of her War of the Roses (or Cousin’s war) series. Gregory says that she has spent her life as an historian of women, their place in society and their struggle for power, especially that large proportion of women whose lives have been ignored by historians in favour of the lives of prominent men. And that was what was so brilliant about the BBC 1’s historical dramatic adaptation of Gregory’s books. They intertwined three of her books about women to make The White Queen. It was the history that we know and love but with women in the centre. My girls enjoyed watching, more than once, the coronation of Elizabeth of York, aka the White Queen. And, the BBC’s did a fabulous job of educating and immersing the viewer in that historical period using twitter, tumblr, and the internet. On their website you could find out more about childbirth and child care at that time to see if Margaret and Elizabeth enduring lots of time away from their children was common or just a plot ruse. You could watch again your favourite bits on the tumblr white queen site as they tried to exercise some influence over their lives by plotting and spying or with witchcraft and prayer. And yet in the Guardian this week, there was a review of the latest films and books about witches and witchcraft stories for teenage girls. The article quotes YA writer Ruth Warburton saying that witch stories are timeless because there is a desire to see girls in less passive roles. Great! But where are the stories of young females using their nous instead of their supernatural powers? I can only think of The Hunger Games in the hero’s quest mould which no doubt my girls will enjoying playing, reading, watching when they are older, even though it is not that jolly to be going off to fight to the death. Or, perhaps we don’t need a female version of a hero’s battling quest. Already, my girls are using technology to design female versions of the stories they like in order to please themselves, which include a lot less fighting and more cape swishing and having a nice time. This appeals to me no end and I can’t wait to see what they do next. Recently, Rebecca Solnit in The Guardian described the year 1995, as that old, slow world you could describe the way George Eliot described life before the railroad. Solnit goes on to describe her stately 1995 routine: She read the newspaper in the morning, listened to the news in the evening and received other news via letter once a day. Her computer was unconnected and so, behaved like a word processor on a desk. Nowadays, her computer is more like a cocktail party full of chatter increasingly fragmented streams of news and data, leaving Solnit to feel like an anachronism in this completely different world. As a computer scientist in 1995, my experience was quite different. I already had my first webpage: ‘Hello World!’ and felt connected. I was a graphics programmer and HCI researcher, and I loved sharing information on newsgroups or by email. I lived in Switzerland and was thrilled when the UK newspapers went online. I no longer had to wait for day old news from good old Blighty. Technology helped my research and enriched my life daily. Ten years on, I trained to be a journalist. During the course, we were told to read all the newspapers everyday and then pitch articles which were very similar to the ones already in the paper. Anniversaries of public events and the deaths, marriages of famous people, were always good fodder to fill up the papers. And a spot of ambulance chasing could get you that human interest story. It did strike me as all a bit old-fashioned. So, I shouldn’t be so surprised that Solnit feels left behind. This new technology is threatening her way of life when really it could be helping her. And it is interesting that Solnit compares the rate of change today with the Victorian railroads and the fast changing world back then. It is a satisfying comparison. Alison Byerly, in her book, Are we there yet? 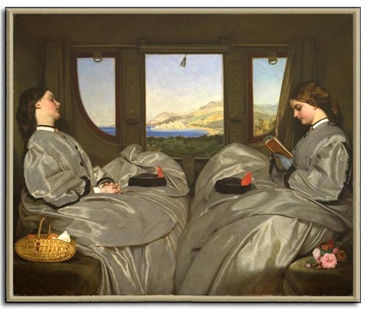 Virtual travel and Victorian realism recently reviewed in the TLS, compares chat rooms to railway carriages, SimCity to hot air balloons, and blog links to K. Jerome’s Three Men in a Boat. She also gives a lovely example of Victorian armchair travel when she describes Albert Smith’s Ascent of Mont Blanc (1851-6), which was an interactive scene of a full scale chalet exterior, a pool of water containing live fish, and ten Saint Bernards who would trot about the auditorium delivering packets to chocolate to children. Smith targeted people who would never actually go to Mont Blanc. It was too far and too expensive to travel in their lifetimes. But they could go along to his exhibition and experience the thrill of the ascent. Today, with a click of a button, we can watch footage of people climbing Mont Blanc and eating chocolate on YouTube. Byerly mentions virtual reality (VR) as another parallel for Smith’s exhibition: but really how many people do you know have a head-mounted display and data-gloves? And really is VR what we need? After, it is a shared experience we are seeking, something we can talk about and take part in together in order to understand. Elsewhere in her book, Byerly gives examples of Victorian full-scale recreations of train crashes and other disasters. Recently, the New York Times ran a long feature called Snow Fall online about an avalanche at Tunnel Creak, Stevens pass, Washington. There are slide shows of the deceased and their families, pictures of the history of Tunnel Pass, and a computer-generated simulation of the avalanche. It is a great piece of journalism enriched beautifully by technology. It is the modern day equivalent of the Victorian exhibitions. According to Wikipedia, journalism began in 1400s. Italian and German businessmen wrote down the latest news and circulated it to their connections in the city. The practice grew, especially during wartime so that the people back home would know what was going on. Journalists were providing a service – informing and updating peoples’ lives. And, now we have access to the latest news all the time. From the simple #hashtag on twitter to longer news articles which are presented in a magazine format by Flipboard. But it is not always new information that we need. Sometimes, we need in depth analysis and explanation, a shared experience, a shared understanding. At best, journalists are recorders of our time. They bring us life changing historical events, perceived injustices, and remind us of things we should never forget. They write it down and revisit so that we don’t forget. Good journalists articulate our thoughts and connect to our minds. Now they can do this better than ever with insightful visualisation whilst connecting information to give us insight and enlightenment. Magazine mogul, Chris Anderson, started the TED talks because he felt that television wasn’t challenging enough and he believed intellectual mobility was the future. In an article in the Guardian, Anderson talks about crowd-accelerated learning, and bringing intellectual stimulus and experience to YouTube audiences by the world’s leading thinkers. The positive adoption of technology by broadcast media and TV networks (like OWN) and some journalists is exciting. Many broadcast and media courses now teach emerging technologies and so the potential is there to create enriching and enlightening features that educate us all. Emerging journalism: a new way of sharing experiences. Back in 2008, Oprah Winfrey hosted a series of webinars with Eckart Tolle to discuss his book A New Earth. There were 10 online sessions. Each recording was streamed live on the Internet and viewers could skype in with their questions which were answered in real time or they could leave questions on the online forum on her website. The webinars were put up on oprah.com so that people coming late to class could catch up in various formats: video, audio, and transcript. Users can still access these various formats , along with a workbook, book club discussion, and other meditation recordings at oprah.com’s bookclub. Oprah ended The Oprah Winfrey Show in 2011, and inspired by her New Earth webinars and using lessons, revelations and aha moments from the show’s history, began Lifeclass in the same year. Oprah had been inspiring viewers to be their best selves from her TV show, and technology had caught up with her. Season One Lifeclass aired weekdays on her wonderfully named TV network: OWN (Oprah Winfrey Network) with nightly webcasts on oprah.com to complement each on-air lesson. She was joined by spiritual teachers and self-help experts. Viewers would skype in. 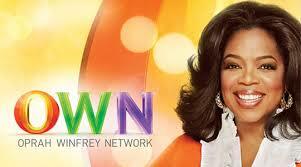 Previous guests of The Oprah Winfrey Show sometimes appeared to share their life learning. And Oprah would read comments and questions off her facebook wall or oprah.com online. It was a completely new way of broadcasting and interacting, especially since the emphasis was on the self-actualisation of viewers. Lifeclass went on tour for Season Two so that most of the webinars were filmed in venues with enormous studio audiences. Season Three took place in Chicago and Texas. And Season Four Lifeclass debuted The Social Lab website online community. It is an example of directed learning with questions and journals for viewers who can then connect to the broadcast as usual live via skype, facebook, and twitter with the discoveries they have made about themselves already shaped ready for them to communicate. And if something they have written resonates with a topic on Lifeclass, then a producer may get in touch with them to be on a class, or to use the words they have written. OWN’s other uplifting show, and the heart of OWN, is called Super Soul Sunday. Viewers can tweet Oprah when it airs and it is filmed for TV and is available on the Internet on-demand for a period of time. This is a direct TV extension of her radio talk show on Oprah & Friends, Radio Sirius XM called Soul Series, where she talks to spiritual writers and teachers to discuss the big questions in life: Why are we here? What is it all about? The archives are amazing and available to download to listen as a podcast. Sometimes one of the teachers, as in the case of Dr Maya Angelou, is profiled at the same time in her O Magazine which you can read online, on your ipad subscription, or in print. And throughout the program whether on OWN TV, or on the Internet, or on-demand on the web, Oprah invites viewers to tweet or facebook her and to watch the movie shorts provided by Soul Pancake which started life as a website for users to create and think on life’s big questions. If you follow Lifeclass, or belong to Oprah’s online community, OWN will send you email to invite you to the next class, or Meditation Challenge, or read a blog about what’s in it for you, or preview content which will be broadcast on OWN. Follow her on twitter, and you get lots of interesting links there. And best of all, when a program airs, Oprah will be tweeting along, giving her opinion, and responding to the opinions of others. OWN is demonstrating how to collect and use the various strands social media at its best. It is a masterclass in participation, openness, conversation, community, and connectedness whilst giving people something good of which to be a part. Online doesn’t get better than this.